Clothing: Light cotton clothes are apt for the year through. We recommend that you cover your body appropriately to protect yourself from getting sun burns. For this carry adequate sun screens. During the monsoons normal summer clothing will do. If traveling in winter, throw in some light woolens. Jaisalmer has quite a good local transportation system and getting from one place to another is easy and convenient. Auto rickshaws are the most comfortable mode of transportation and cabs, both government and private, are also available. Opt for government operated ones that have authentic rate-cards. Another option is to get on board the city tour and sightseeing buses which are a bit cheaper, though not as comfortable. Jaisalmer Fort : This is one of the largest and most formidable forts in Rajasthan, perched on the Trikuta Hill. Towering to a height of almost 250 ft, its yellow sandstone walls, which turn honey-like with the setting turn, have earned it the title ‘Golden Fort’. The fort is made of 3 layers of walls – the outer wall is made of solid stones, the second wall protects the fort from inside and the third wall was used by warriors to hurl boiling oil, water and stone missiles to enemies between the first and second wall. Further strengthening its defenses are the 99 bastions. This fort, earlier, used to house the entire population of Jaisalmer, and even today, quite a number of people have their homes inside. On exploration, you come across colourful bazaars selling a range of goodies and several interesting structures that were added by the Hindus, Jains and Muslims – a fine example of the secular thoughts of the ruler. Among the most prominent structures inside is the seven-storeyed Raj Mahal (Royal Palace), situated at the Dussehra Chowk, which is centre of the fort. This Royal Palace is intricately carved balconies and jharokhas and has been converted into a Museum & Heritage Centre, which houses interesting artifacts like kitchen utensils, weaponry and royal garments. Within the Royal Palace, the Rang Mahal is known for its mirror and paint works and the Juna Mahal for its jali screens. Similarly, the Sarvotam Vilas flaunts beautiful blue tiles and mosaic-works. Other rooms within the palace are done with beautiful frescoes on the walls and ceilings. The seven Jain Temples are some of the oldest structures in the Jaisalmer Fort, built over a period of time and dedicated to the Jain Thirthankaras. Built in yellow sandstone, exquisite carvings adorn the temple walls. The temple complex is flanked by shops selling Rajasthani handicrafts, turbans, traditional clothes and colourful puppets. The campus also has a Gyan Bhandar Library, which houses a good collection of artifacts and rare manuscripts. The Laxminath Temple is less-ornately done but has a dome exhibiting fine paintings. The Jaisalmer Fort has four huge gateways, namely - Akshaya Pole, Suraj Pole, Hawa Pole and Ganesh Pole. Images of the Sun God adorn the Suraj Pole and an idol of Lord Ganesha is placed on the Ganesh Pole. The Fort houses several interesting havelis or palaces constructed by the rich merchants who visited and stayed within the fort. These havelis are beautifully carved, and the highlights include filigree work, jali windows, pavilions and beautiful balconies. Nathmal ji-ki-Haveli: Built by two brothers, this was the residence of an erstwhile prime minister of Jaisalmer. The architecture of thi haveli is particularly noteworthy because the left and right side of the haveli have slightly different details. The highlight of this grand palace are two yellow stone life-size elephants, who seem to guard the palace! Other carvings and images include those of horses, cattle and flowers and more modern images of cars and fans. Salim-Singh-ki-Haveli : Located below the Trikuta Hill, this is one of the most striking palaces, with the roof carved out like a peacock! Stone elephants stand guard to the haveli and the palace contains almost 38 balconies with different designs. The façade is often said to resemble a ship, thus earning it the name Jahaz Mahal. Patwon-ki-Haveli : These are among the most important havelis in Jaisalmer, built over almost 50 years, since this is not a single haveli, but a cluster of 5 havelis. These havelis are also referred to as the Mansion of Brocade Merchants, because the family who owned it is said to have been dealers on gold and silver threads. Beautiful paintings and mirror-work adorn the walls and its gateways and arches have different designs. Located inside the haveli is the office of the Archeological Survey of India and State Art and Craft Department. Tazia Tower : An important tourist spot, this tower is located within the Badal Mahal complex near the Amar Sagar Gate. The tower is 5-storeyed and each floor has its own individually designed balcony. Gadsisar Sagar Lake : This is one of the most beautiful tourist attractions and a famous picnic spot. This is not an oasis, but a water conservation tank made to preserve some of the rainwater. This lake attracts a large number of migratory birds. Temples and shrines dedicated to Vishnu and Krishna surround the lake and the beautiful Tilon ki Pol arches on its banks. Desert National Park : Located about 40 kms from Jaisalmer, this national park is counted among the largest in India. The park is built on what was earlier a saltpan, and owing to its location, it also contains sand dunes. Several migratory birds have made it their home and one of the most common sightings is the Great Indian Bustard. Other varieties include Spotted Eagles, Falcons, Buzzards and Vultures. Hire a jeep to explore the park and don’t forget to carry a good pair of binoculars and camera. Desert Culture Centre and Museum : This houses some of the best preserved arts and artifacts of Jaisalmer. Interesting exhibits include old rare coins, kitchen utensils, weapons, manuscripts, textiles and an interesting collection of fossils excavated from the Thar Desert. Sam Sand Dunes : Located about 42 kms from Jaisalmer, the Sam Sand Dunes are extremely popular as camel safari spots. We recommend taking an entire package that lets you enjoy a tour of the desert on a camel, followed by a bonfire, folk performances and sumptuous Rajasthani cuisine. Lodurva : Located 16 km away, Lodurva derives its fame from the ruins of a Jain Temple and a mythical wish-fulfilling tree. Among the most known temples, is the Parshvanath Temple, which sports an extremely ornate toran and a black image of Parshvanath with a multi-hood serpent shade. Other well-known Jain temples include Rishabhnath Temple, Shambhavanath Temple and Ajitanath Temple. The Kalpavriksha Tree is the substitution of an original tree, which died. Made of eight metals, the copper leaves are believed to grant wishes. Amar Sagar Palace & Lake : Located adjacent to the Amar Singh Palace, pavilions with steps lead to the lake. The haveli is a beautiful 5-storeyed structure and is known for its murals, which adorn the walls. There is also an old Shiva Temple in the complex. Bada Bagh : Literally meaning Big Garden, this site houses a garden, a tank and a dam. The tank and dam are built of solid blocks of stones and the Govardhan Stambh was erected to commemorate the construction of the two structures. The chattris or cenotaphs within the garden were erected one for each ruler. Mool Sagar : Located about 8 kms from Jaisalmer, this is a pleasant garden and tank, belonging to the erstwhile royal family and built as a summer retreat. The main attraction here is the Shiva Temple, which is believed to have been built by two large slabs of sandstone. The royal palace within is known for its striking paintings and murals. Eating out in Jaisalmer is never a problem, considering the fact that it is one of the most-loved tourist hot spots in Rajasthan. Of course, all well-known hotels have their in-house dining options, but the bazaars are lined with stalls and cafés selling real Rajasthani fares. For authentic Rajasthani cuisine, head out to Trio, one of the most famous restaurants that conjures up, quite amazingly, a cool combination of subz-e-murg and naan, along with a range of western foods. Gokhra is another great rooftop restaurant that serves Indian, Chinese, Continental and Rajasthani cuisine. Not only does it have a great view of the Golden Fort, it also has live performances by Rajasthani artistes every evening. Poolside Barbeque lets you offer traditional Rajasthani and Indian fares in an utterly romantic setting next to (obviously) a pool! Saffron at Nachana Haveli Hotel and Bikaner at Hanuman Chowk offer inexpensive Rajasthani thalis. Little Italy inside the fort offers a lavish spread of Italian food. Recommended try - Bruschetta and Pasta Arabiatta! 8 July Restaurant, also inside the fort offers a combination of lassis, milkshakes and sandwiches. Remember that the restaurants at the fort are all vege. If you can’t do without the usual pasta and pizza, along with the beer, try the Ristorante Italiano la Purezza. Equally interesting are the cocktails and barbeque at Paatu the bar at Fort Rajwada. Gulp down some bhang from Gopa Chowk or carry some bhang cookies home! The best place to hunt for some traditional Rajasthani wares would be inside the Fort. It is lined with shops selling Rajasthani handicrafts made of camel hair, silver jewelry, antiques, old stonework, trinkets and traditional oil lamps. Especially known for its reverse printed fabrics and Rajasthani mirror-work there are lots of shops that sell these. If you want to get your hands on tie-and-dye saris, head out to the government operated Khadi Gramudyog Bhavan and Barmer Embroidery House, located near Patwon-ki-Haveli. Jaisalmer is also known for its puppets, which are definitely a must-carry home and are available at the market outside the Fort, Sunset Point and Bhatia Bazaar. These puppets are simple, but beautiful, complete with silver-gold lining work. Jaisalmer comes to life during the Desert Festival, which is held for 3 days in February. Set against the backdrop of the Fort and the Sam Sand Dunes, interesting events and competitions take place, such as Best Moustache Contest and Mr. Desert Contest! The highlight of the festivals are the rope-walkers and Fire Dancers, who wear vibrant and brightly colored costumes and sing and dance to regional tunes. Participate in turban-tying contests, camel racing and camel polo, and watch snake charmers, puppeteers, and acrobats performing excellent sports! The camels are a major attraction of this festival and they are all brightly decorated in tinkling bells and bright gorbandhs made of shells and sequins. Ballads speaking of the Rajasthani culture and history, and regional folk dancer performing the traditional ghoomar, dhaap, tehratal, ghair and moria dances are added attractions. This festival is one of the best times to get your hands on some true Rajasthani arts and crafts. Remember that prices tend to be higher at this time, but if you have the eye for the right thing, it’s really worth it. 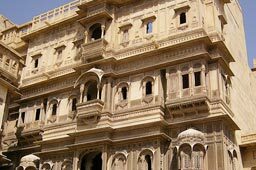 Himmatgarh Palace, located right outside the Fort, with easy access to most important sights of Jaisalmer. Of course, like most cities in Rajasthan, booking well-ahead is the mantra! Air: Jodhpur Airport, 300 km away is the closest airport. Since Jodhpur is connected to most major cities, this is quite a decent option. Hire a cab or a taxi to reach Jaisalmer. We strongly advise giving the local bus from Jodhpur to Jaisalmer a miss. Rail: Jaisalmer Station is well- connected to Delhi and Jaipur. Road: Jaisalmer has a good network of roadways and is well connected to several states in Rajasthan and Delhi. Private and luxury buses are available though the best option would be to hire a car. Jaisalmer owes its origin to Raja Jaisal after whom the city is also named. When he was searching of an apt base to move his kingdom from Lodurva, he came across a three-peaked hill, where the Jaislamer is now located. It is said that Raja Jaisal was told by a sage that Lord Krishna had prophesied that one of the Yadav descendents would set up a kingdom here. Thus, with the help of wealthy Jain traders, Raja Jaisal built the massive fortress and established the kingdom of Jaisalmer. Within the ramparts of this fortress, subsequent temples and shrines were added by Hindus, Jains and Muslims.